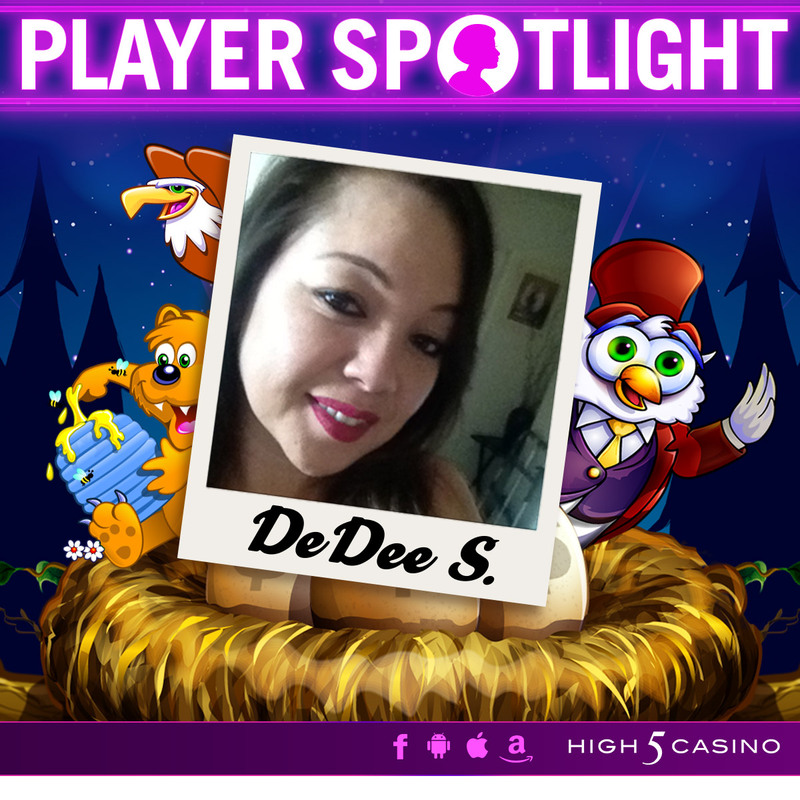 Player Spotlight – DeDee S.
Get to know one of your amazing High 5 Casino friends in today’s Player Spotlight – DeDee S. from Los Angeles, CA. If DeDee could go to lunch with a High 5 Casino character, she would choose Stella Drive! Who would you choose? Check below and see if you and DeDee share the same answers! 1. How did you hear about High 5 Casino? 2. What is your favorite High 5 Casino game of all time? 3. You’re in trouble, which High 5 Casino character would you call to your rescue? Why? The Lovely Outlaws, because no one can refuse a beautiful face. 4. If you could go to lunch with a High 5 Casino character, who would it be? Why? Stella Drive, so I could ask here where she got her thigh high boots! 5. If you could vacation in one of our games, which game would you choose? Why? Island Eyes, because I love the jungle and the blue ocean paradise! 6. In your opinion which High 5 Casino game has the best bonus feature? Why? Red Panda Palace because it has 2 different bonus features! 7. Which High 5 Casino game do you have the highest game level in? 8. Fight Night: If you had to choose two High 5 Casino characters to fight each other, which characters would you pick and who do you think would win the fight? Twin Win Dolphin and the Majestic Sea Shark. The Dolphins would win hands down! 9. Name your top 3 favorite High 5 Casino games! Hoot Loot, The Amulet and the Charm, The Lovely Outlaws! 10. Which High 5 Casino game do you think has the best graphics? Why? Sapphire Tiger, I love the awesome colors! This entry was posted in High 5 Casino, High 5 Games, High 5 Moments, interview, Player Spotlight and tagged Android, App Store, Apple, Facebook, Free Games, Google Play Store, High 5 Casino, High 5 Games, Hoot Loot, iOS, iPad, iPads, iPhone, iPhones, Majestic Sea, mobile gaming, Player Spotlight, Red Panda Palace, Sapphire Tiger, social gaming, Stella Drive and the Orb of Chance, The Amulet and the Charm, The Lovely Outlaws, Twin Win by hoothigh5. Bookmark the permalink.